In February, 2014, Aspen, as a subcontractor to PMC, prepared the County of San Luis Obispo Renewable Energy Streamlining Program (RESP) Opportunities and Constraints Tech­nical Study (OCTS). It uses GIS to identify the County’s renewable energy resources and to identify locations where development of those resources could most feasibly be streamlined while avoiding negative impacts to the environment. 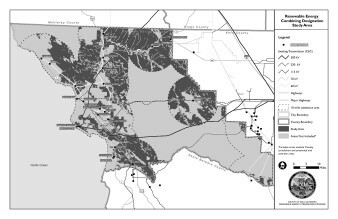 Data for the OCTS primarily consists of San Luis Obispo County-created datasets from the General Plan as well as data from other public agencies including CEC and SLO Council of Governments (COG), and in some cases data created by Aspen. For the OCTS, Aspen resource specialists consulted with the spatial data to determine the relative impacts that would be caused by small to medium-scale renewable energy development projects. Spatial data of each resource was then weighted based on how much it would potentially restrict renewable energy development. 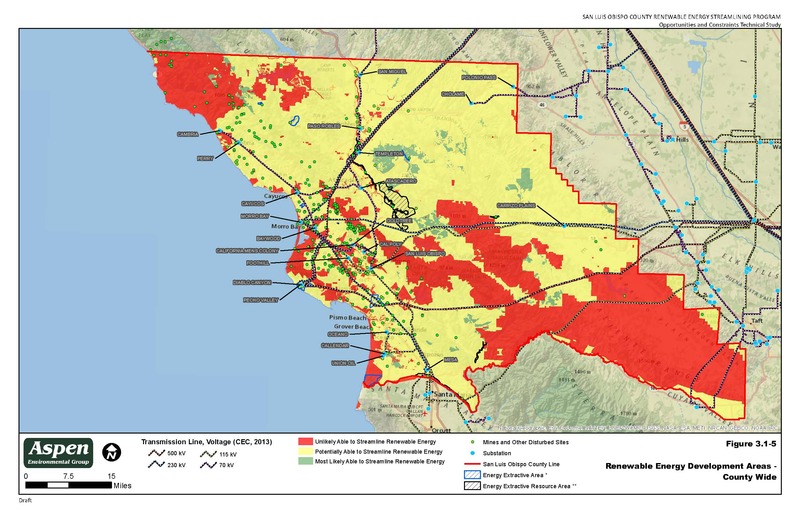 In addition, Aspen mapped transmission line and distribution system resources and analyzed the San Luis Obispo energy load to determine the capacity of the electric grid for tie-in of future projects. From there, Aspen overlaid the weighted resource layers and electric system maps to identify Renewable Energy Development Areas (REDAs) where renewable energy development could exist with minimal environmental impacts. A map book was created, illustrating the locations of resources and potential development areas. The OCTS also included extensive information regarding the federal and State policy and regulatory environment for renewable energy. Aspen provided research results related to federal, State, and County policies that would affect the socioeconomic impacts of renewable development. Subsequent to the OCTS publication, Aspen utilized the resultant GIS data and spatial analysis to assist the County and PMC in developing the County’s Renewable Energy (RE) Combining Designation, which is the zoning code update portion of the RESP. Aspen has developed the Combining Designation map. In addition, Aspen has provided input into the RESP program description by providing megawatt output assumptions, RE project parameters and construction, operation, development assumptions, utility and transmission line ROW definitions, and RE technology descriptions. Aspen assisted PMC in preparation of the RESP EIR, which was published in November 2014. As part of the EIR analysis, Aspen developed zoning code standards and revisions to help offset potential RESP impacts. One result of the EIR will be an application checklist for projects seeking to site within the RE Combining Designation. This checklist is intended to provide the requirements and details of factors that can qualify a project for permit streamlining under County requirements.